Romanian sculptor Arghira Calinescu graduated from the Bucharest Academy of Fine Arts in 1962. Since then, his practice has steadily developed within the traditional boundaries of sculpture, particularly his stone pieces, which have been featured in a number of international symposia. In Calinescu’s aesthetic universe, bold geometric shapes are often organised and articulated to make up objects resembling mechanical or industrial devices. 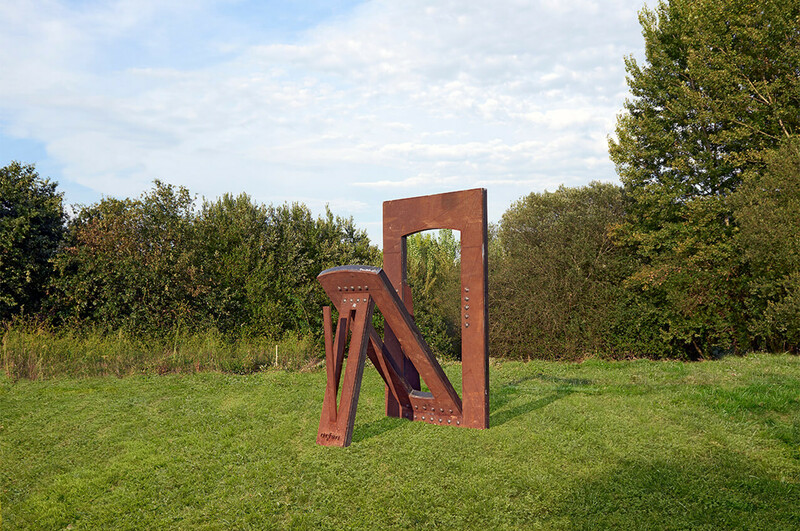 Whether life-size or monumental, his pieces have challenged sculpture’s formal possibilities and vocabulary, by establishing close ties with architecture and therefore with viewers’ bodies, as they are expected to interact with the artworks, occasionally by touching and handling them. Consistent with the main guidelines of his production, Calinescu has brought to Santo Tirso a weathering-steel piece showing a patterned dissection of a rectangular vertical plane, broken down from the outside in to the centre. This work of cutting out to geometric deconstruction seems to closely follow a “leaving no remnant” principle. Though three-dimensional, the trajectory of this spatial drawing is always traced back to its starting point and to the flatness of the original plane, thus creating a sculptural composition imprinted with the author’s intentional agency.